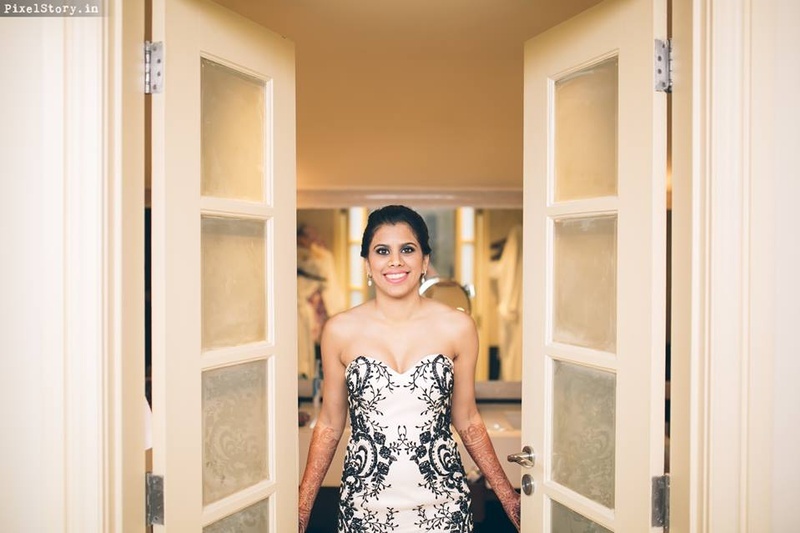 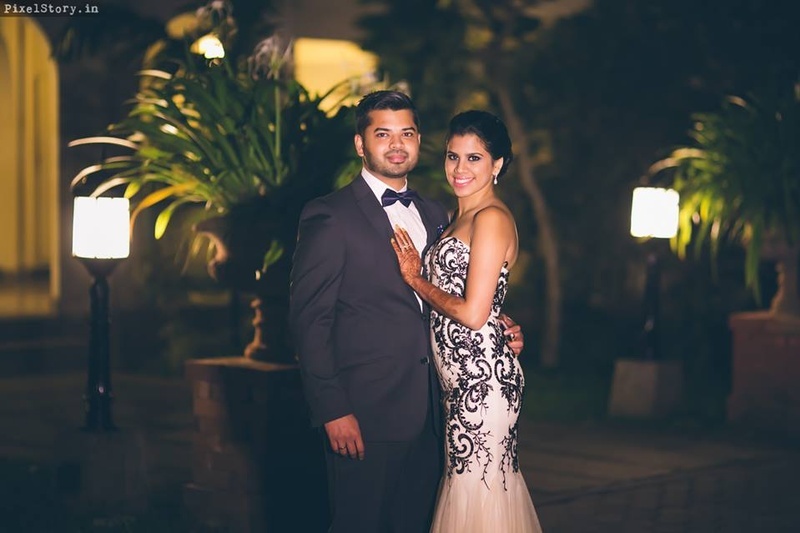 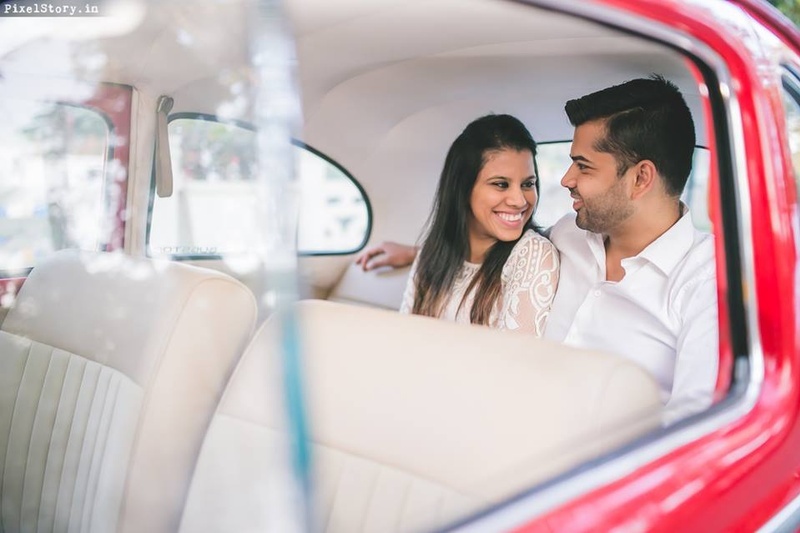 As Pratibha and Ashwin come from different cultural backgrounds – she, being a Kannadiga Hindu and him, an Anglo-Indian Catholic, the decided to have the best of both worlds at Taj West End, Bangalore. 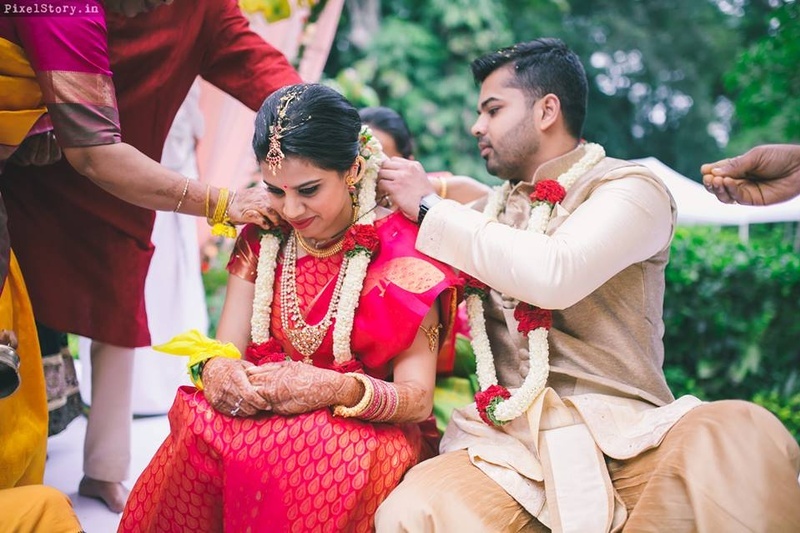 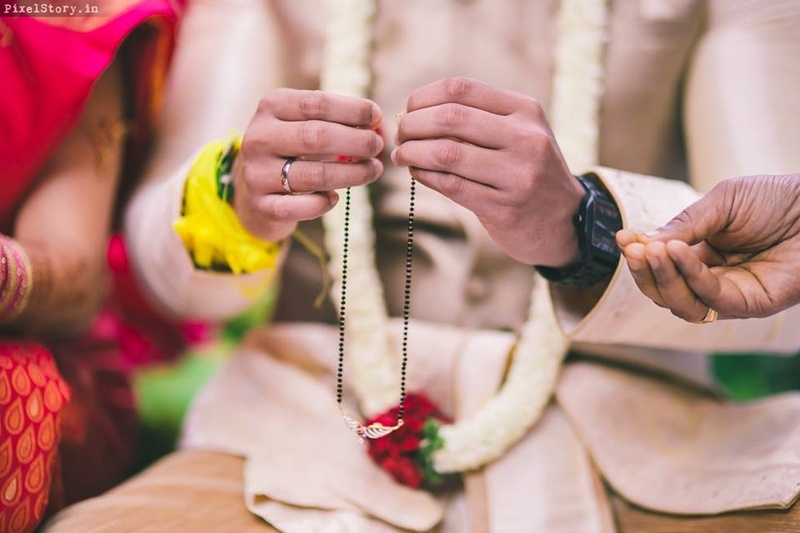 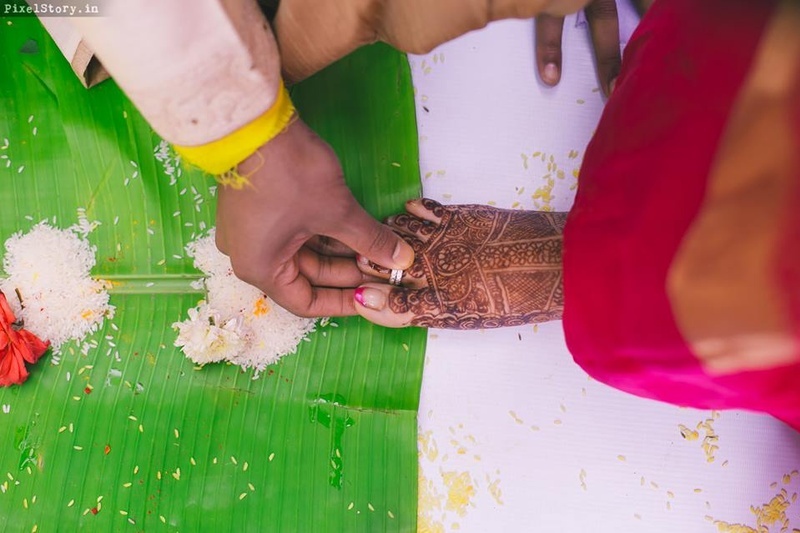 The wedding day started off with a South Indian style wedding ceremony co-ordinated by Pratibha’s mum, all with the help of the meticulous wedding planners at 3 Productions. 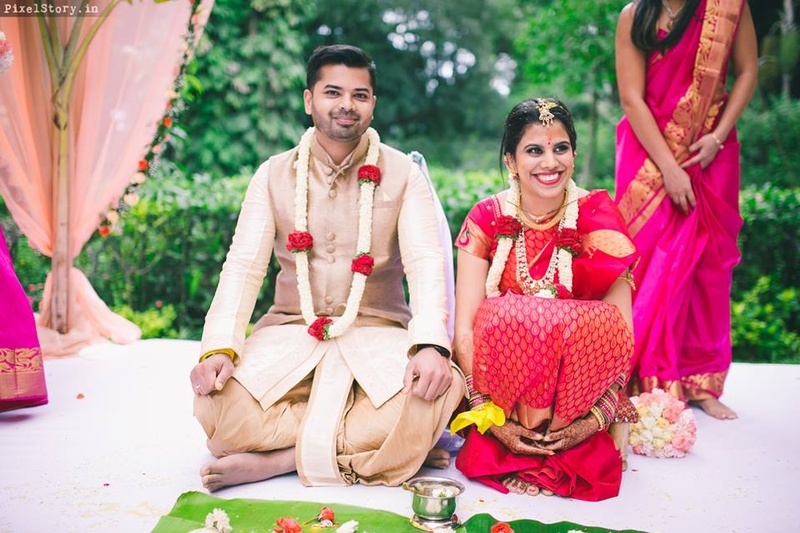 In terms of décor, they chose pastel hues. 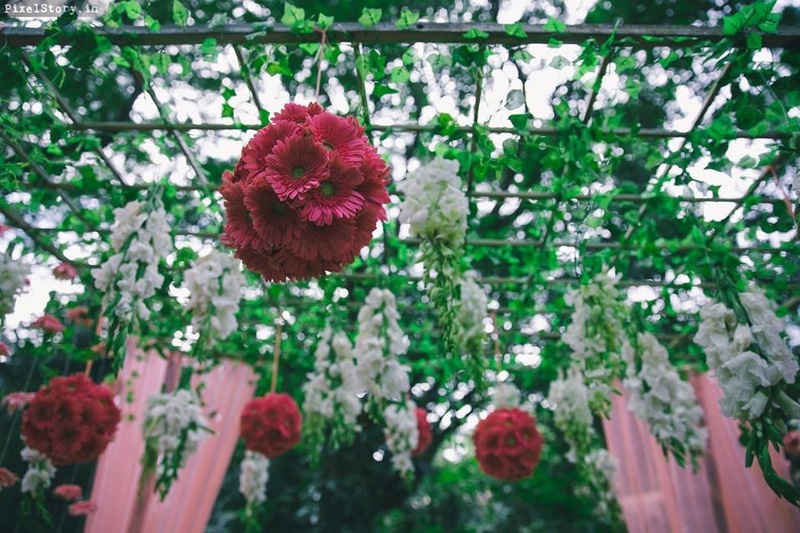 3 Productions suggested having marquees for an added touch of elegance. 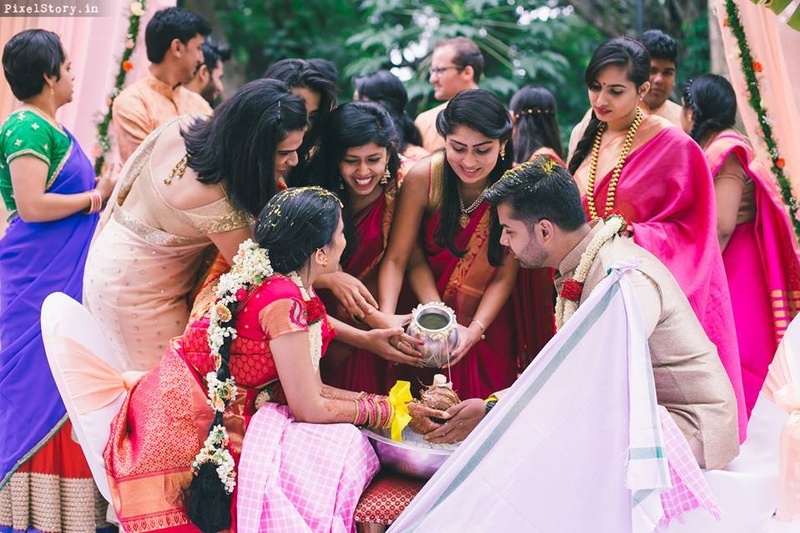 They even had a bridal party that served as the Catholic touch to a solemn South Indian ceremony. 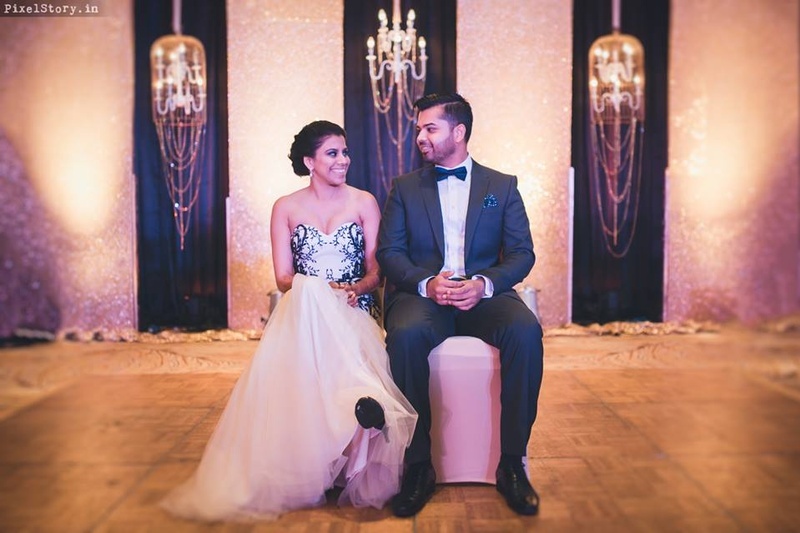 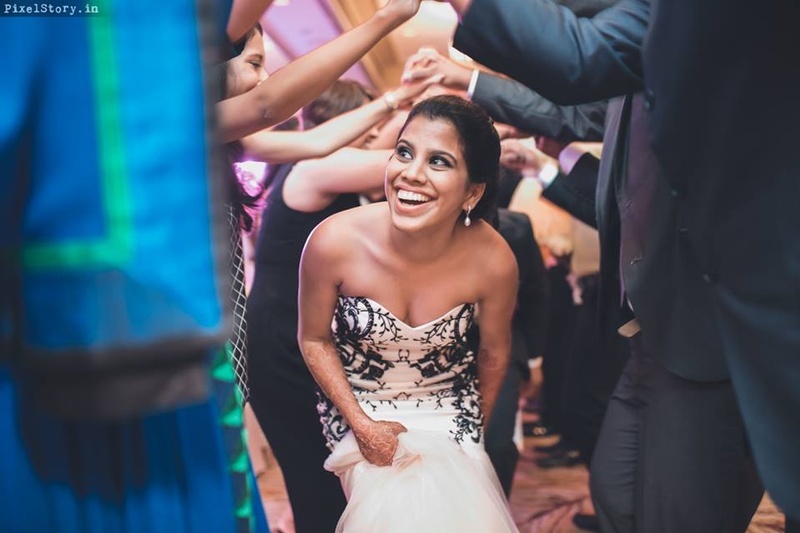 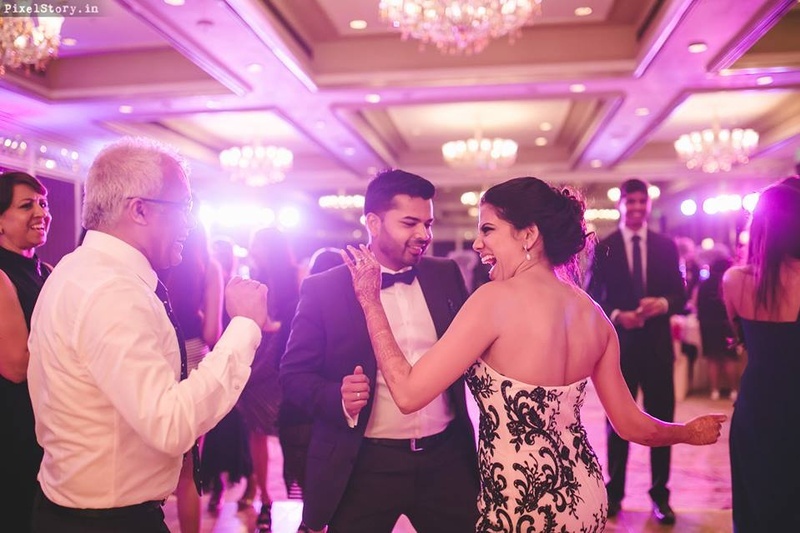 The after party was everything Anglo, from having Ashwin’s guitar teacher’s band from Coonoor playing on the night to the Grand March to the vintage chandelier – it was exactly what they had envisioned. 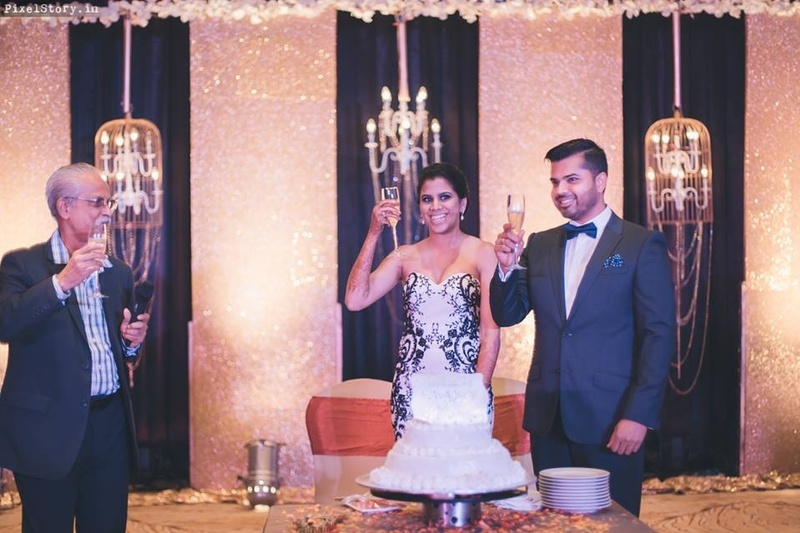 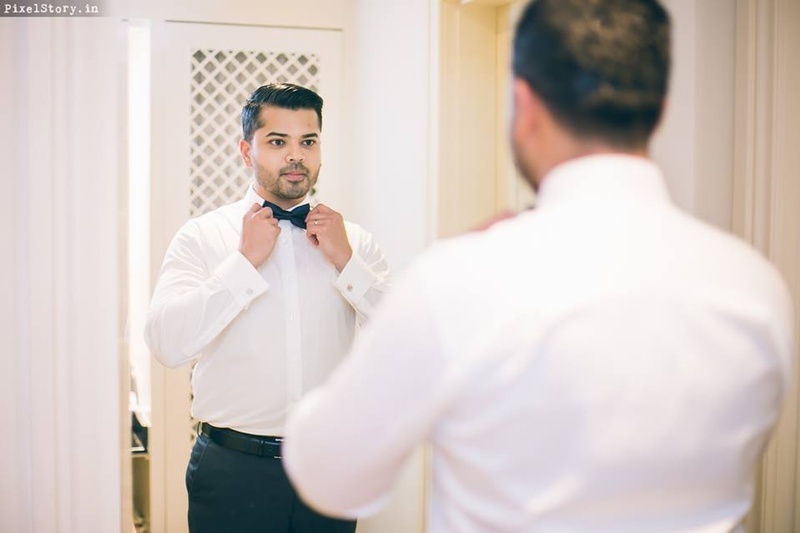 The eventful night included the first dance, the father-daughter dance, a toast by Ashwin’s uncle, the maid of honour speech and bride and bride groom speeches. 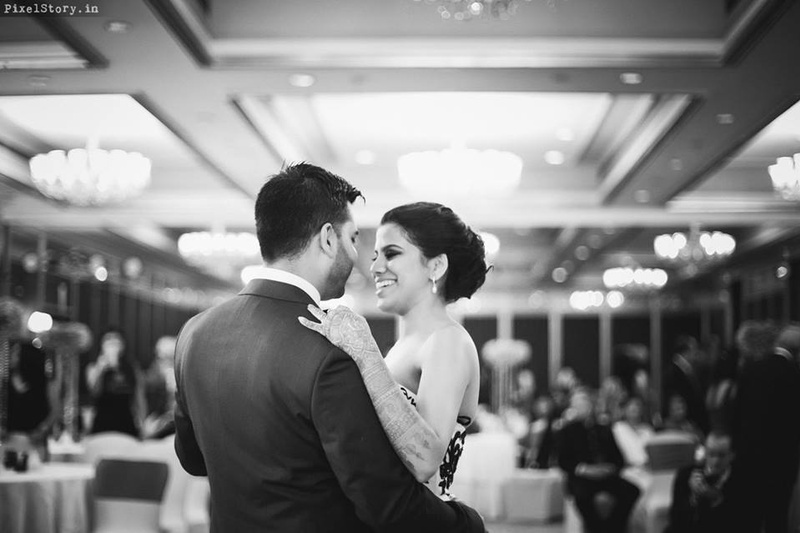 What we really loved about this couple is how adorably they spoke of one another. 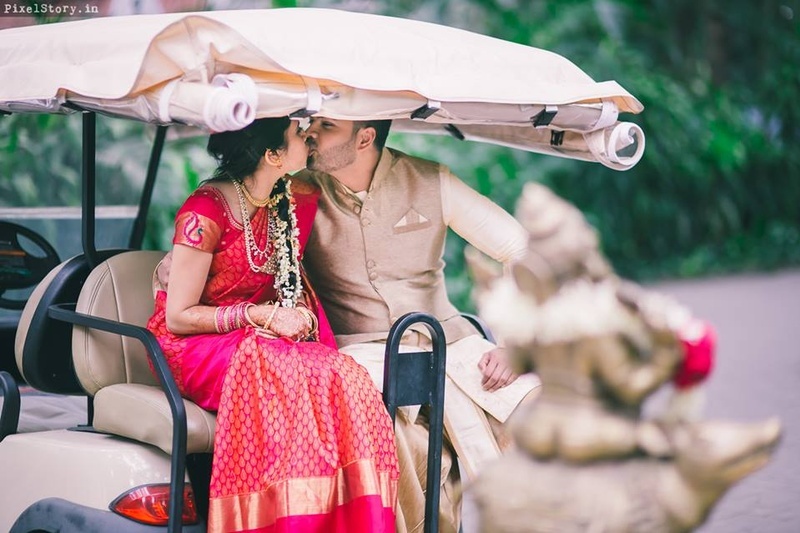 #relationshipgoals! 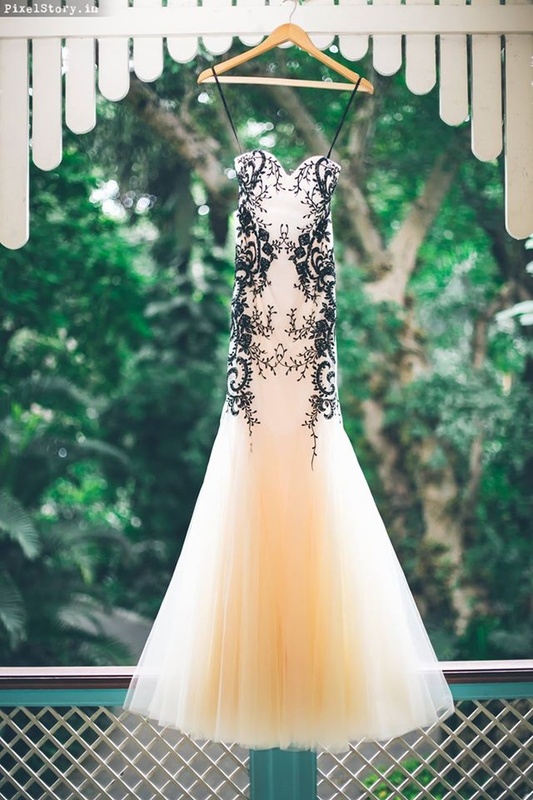 Bride's After Party outfit - Duchess Boutique, Melbourne. 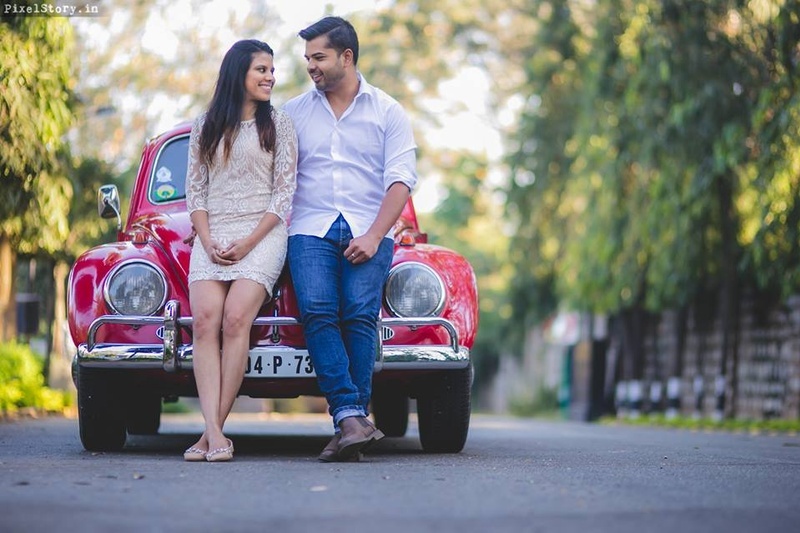 Cute pre wedding shoot by PixelStory.in. 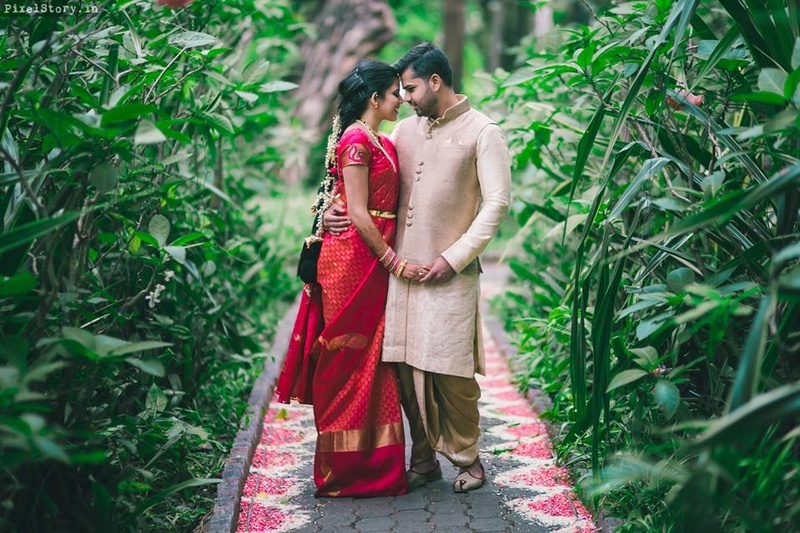 Wearing color coordinated outfits for their pre wedding shoot. 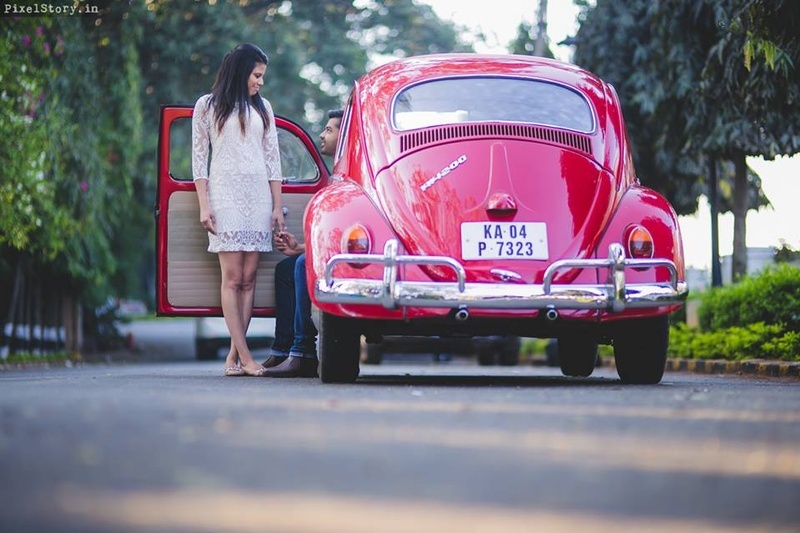 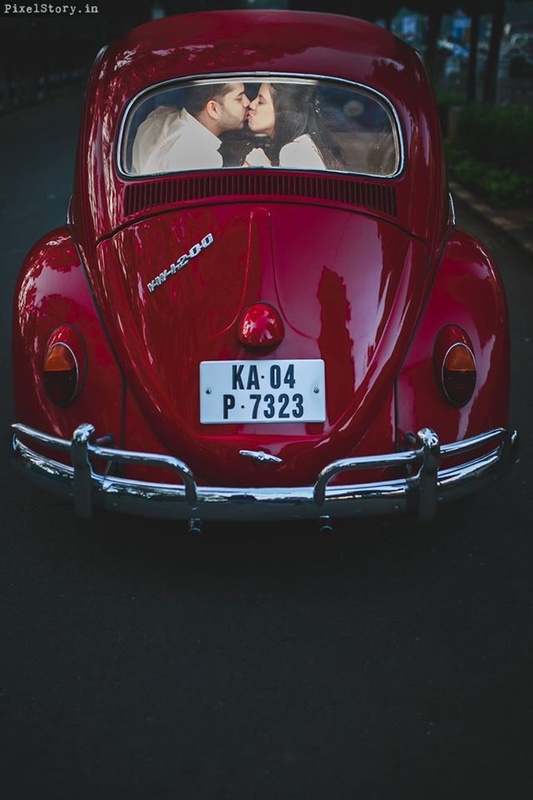 Retro ride and lots of love. 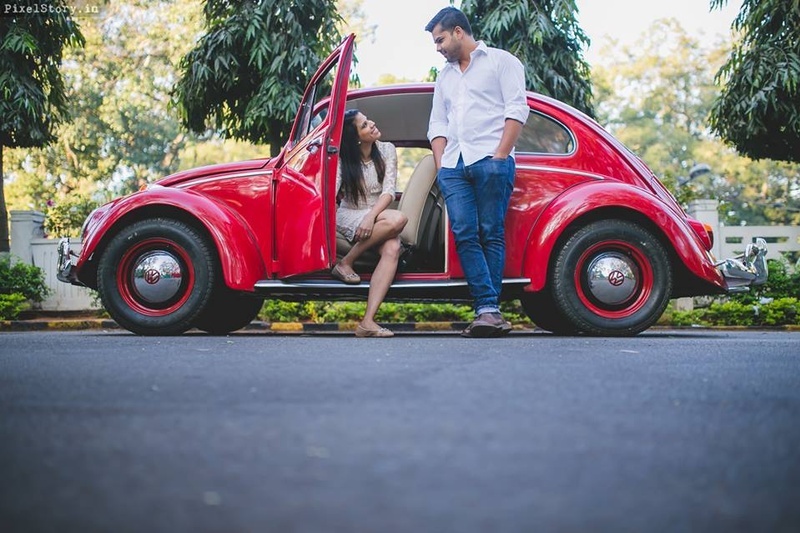 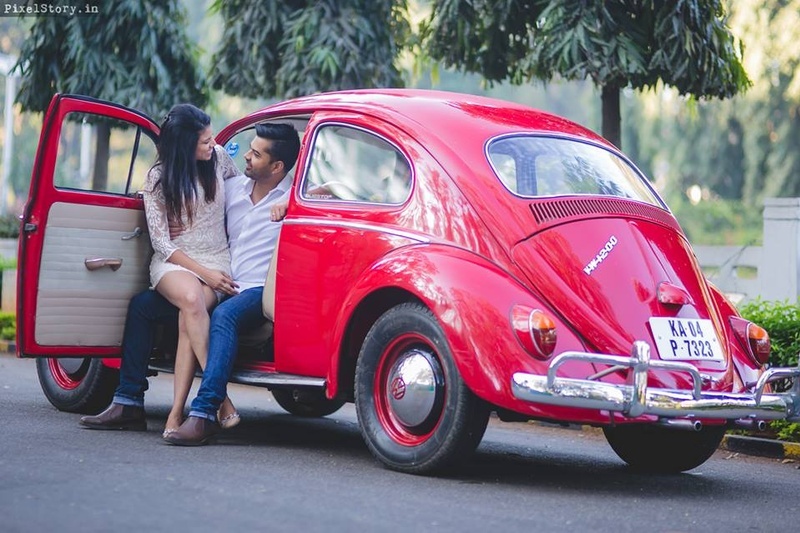 Pratibha and Ashwin posing cutely for their pre wedding shoot. 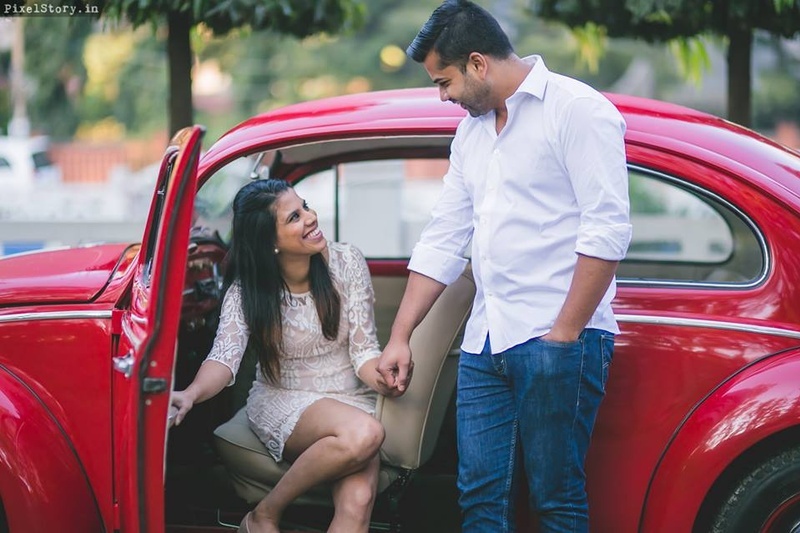 Pratibha wearing white lace dress and Ashwin complementing her in white shirt and blue denims. 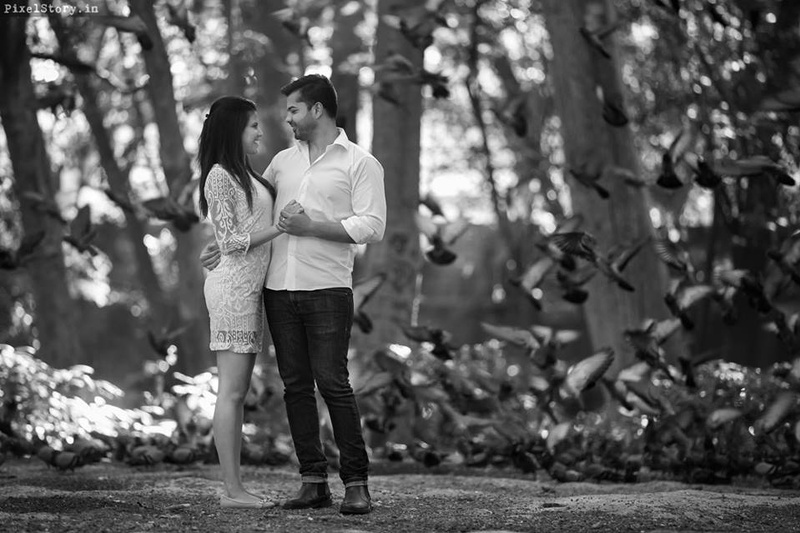 Black and white pre wedding shoot. 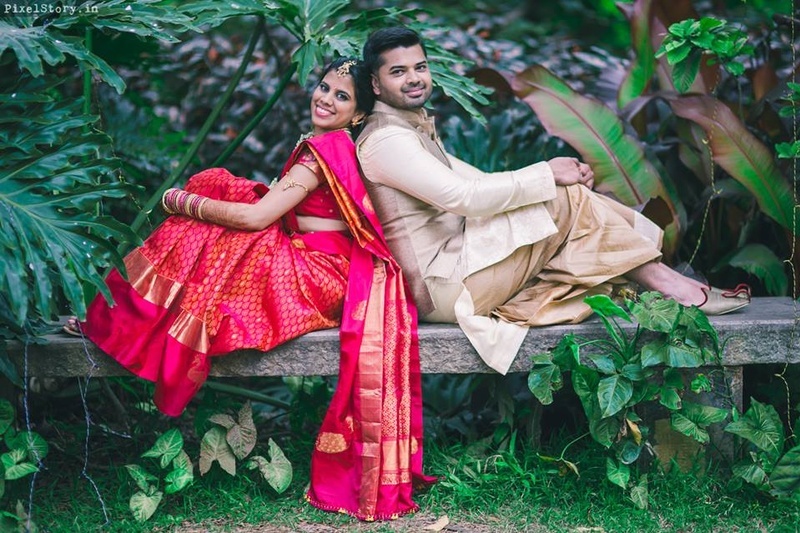 Pratibha looking beautiful in this red and gold South Indian Saree and Ashwin dressed royally in off white Bandhgala and Dhoti . 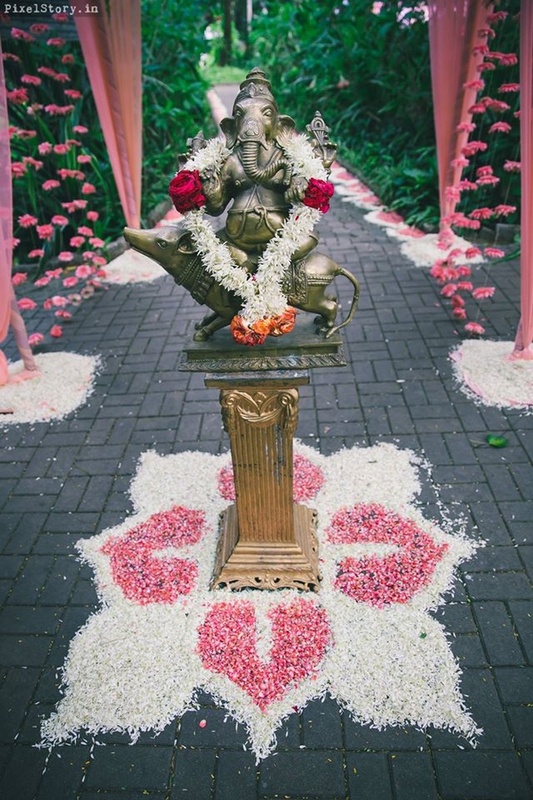 Wedding entrance beautifully decorated with pink and white flowers. 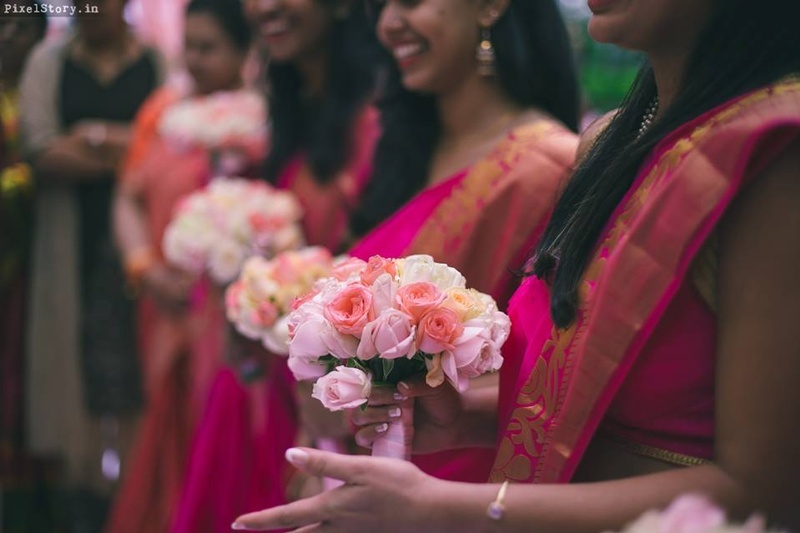 Bridesmaids holding pretty pink roses for the wedding ceremony. 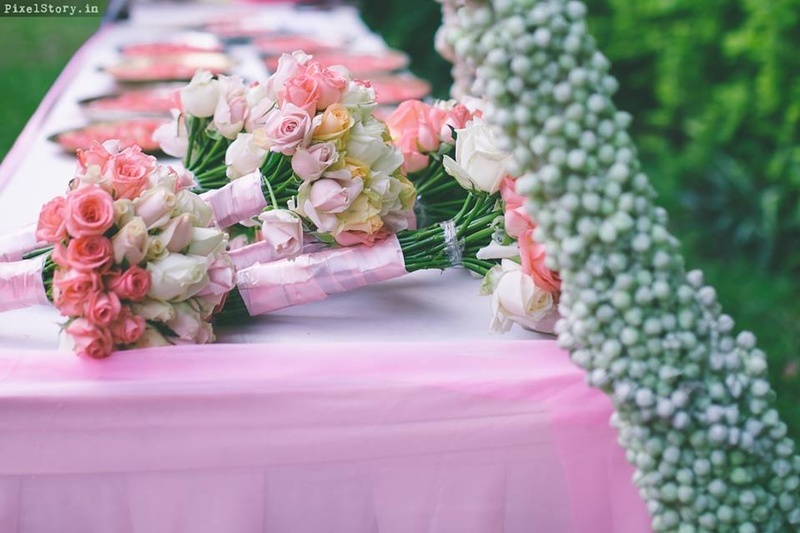 Bold pink sunflowers and white lily hanging decor. 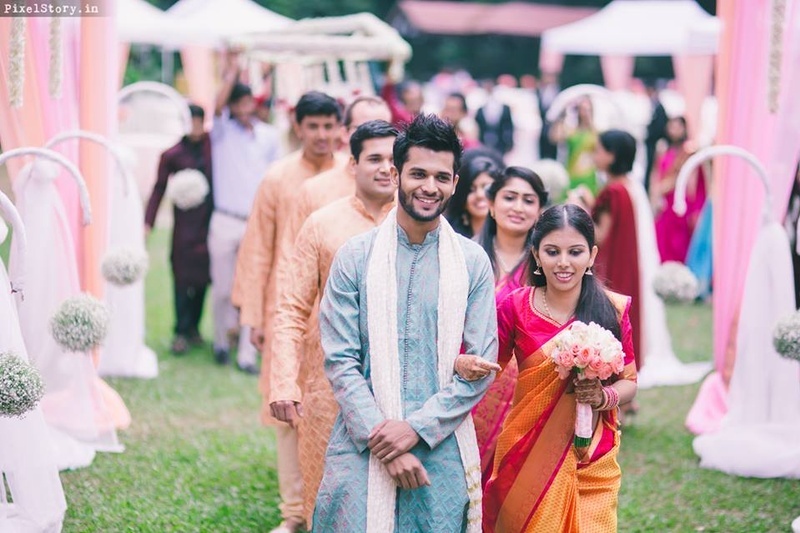 Bridesmaids and Groomsmen walking down the isle before the bride and groom enters. 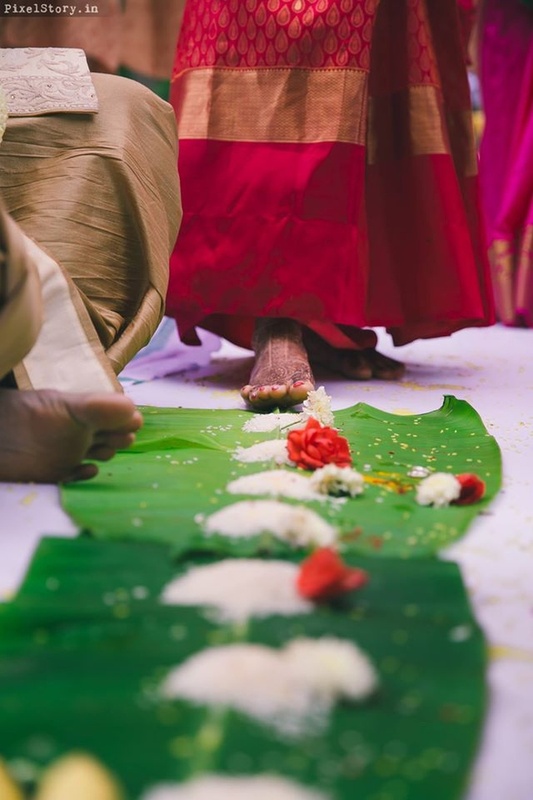 Wedding rituals shot beautifully by PixelStory.in. 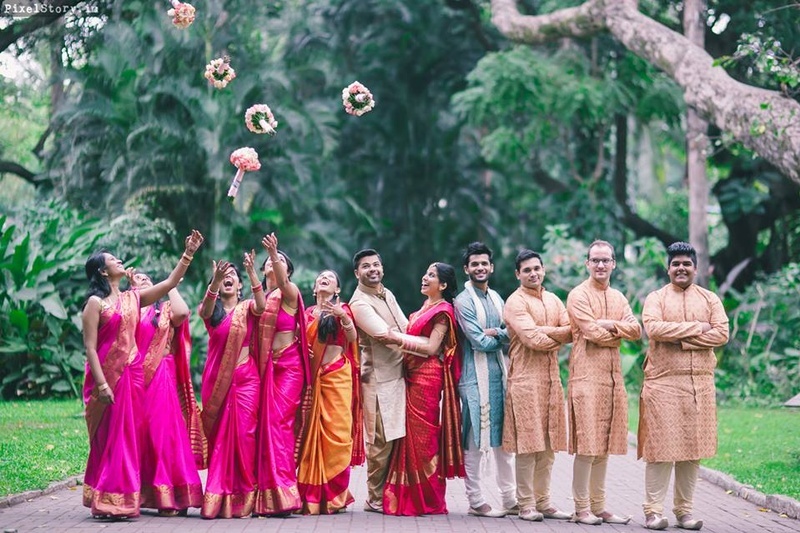 Beautiful all-in-pink-bridesmaids doing some wedding rituals for the wedding ceremony. 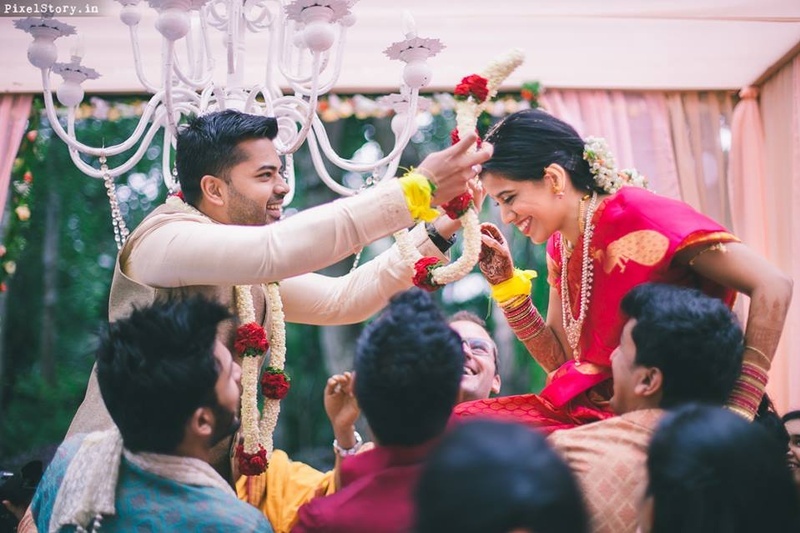 Pratibha and Ashwin's varmala ceremony held at Taj West End, Bangalore. 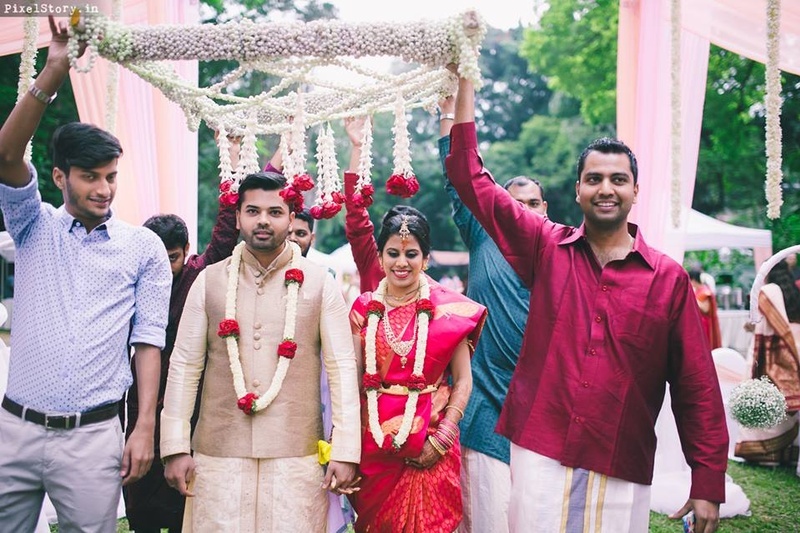 Happy couple just got hitched wearing white and red flower garlands. 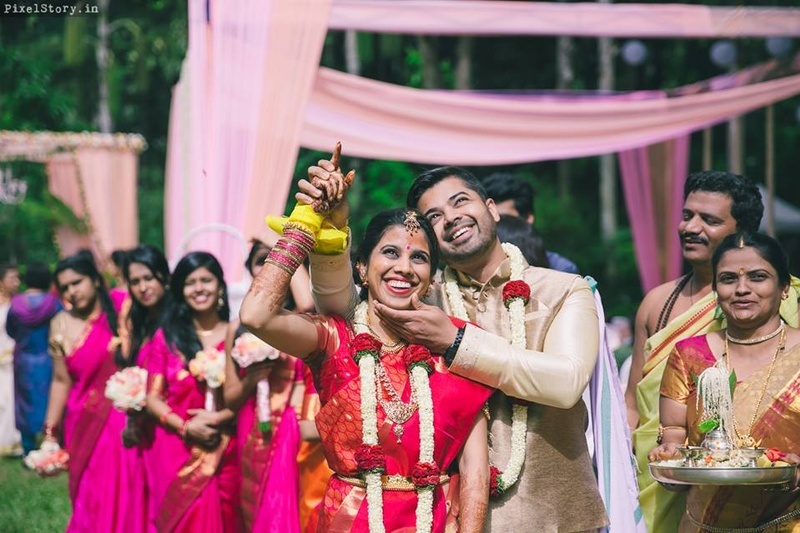 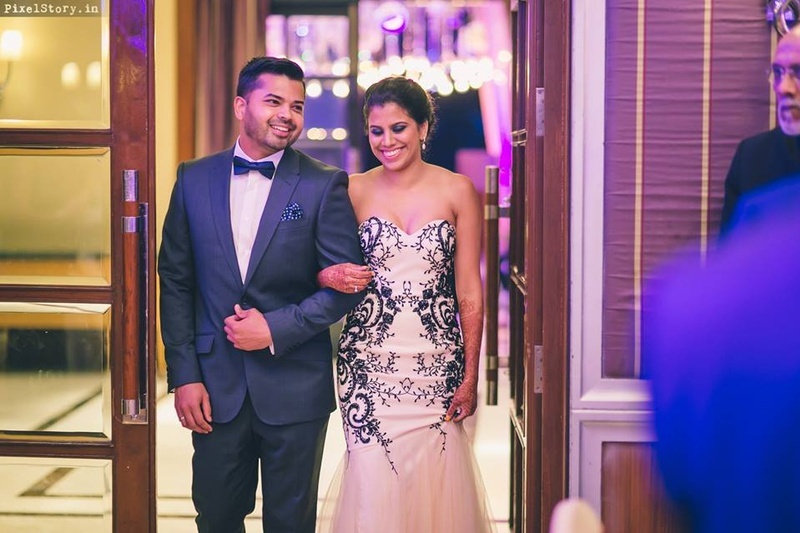 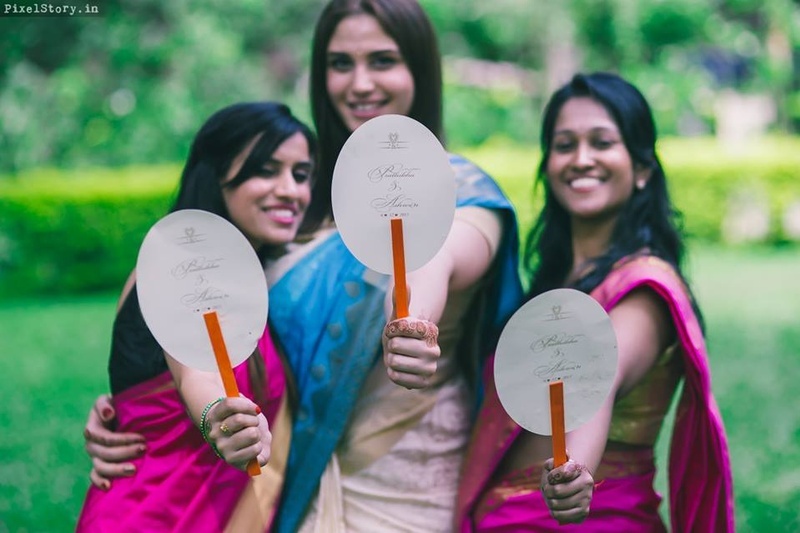 Beautiful and quirky South Indian Wedding held at Taj WEst End, Bangalore. 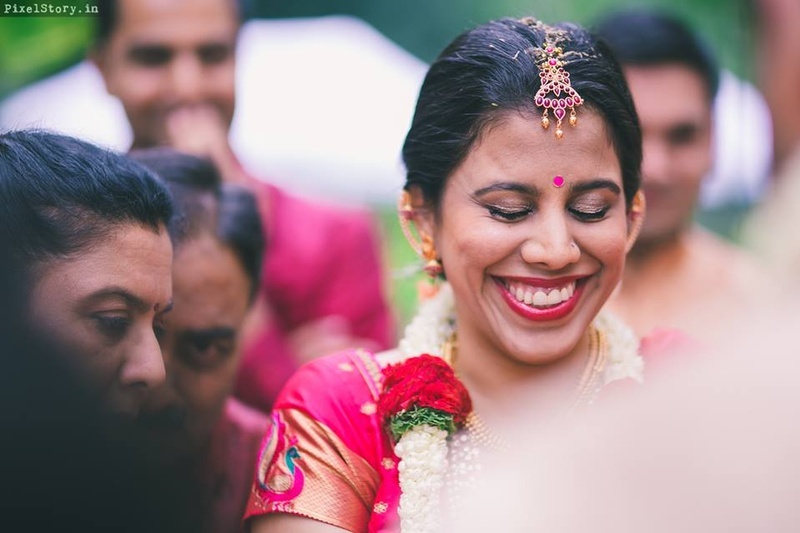 Pratibha smiling out of joy after the wedding ceremony. 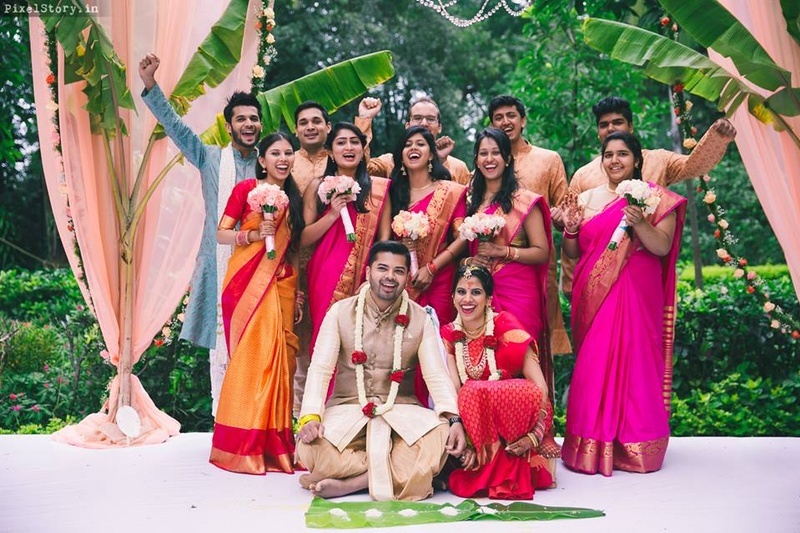 Bridesmaids color coordinated with Bride in shades of pink white all the groomsmen color coordinated with Groom in shades of Peach. 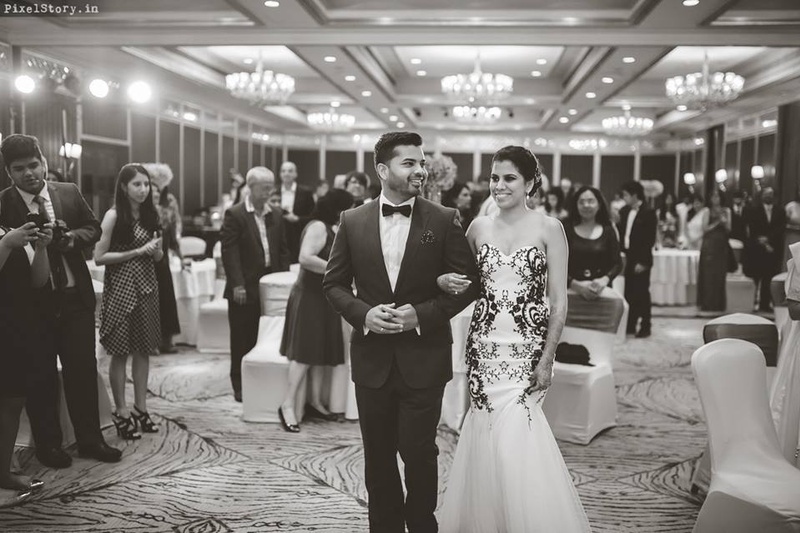 Bride and groom walking down the isle after their wedding ceremony. 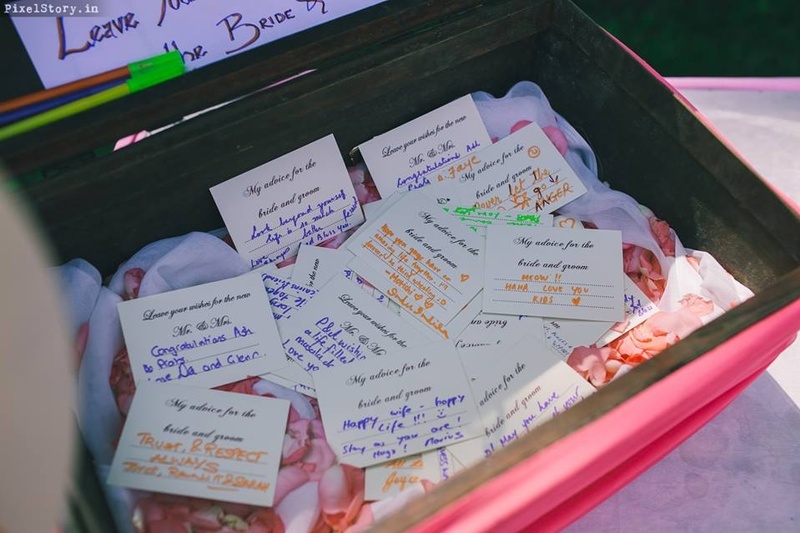 Cute wedding notes from the guests for the Wedding couple . 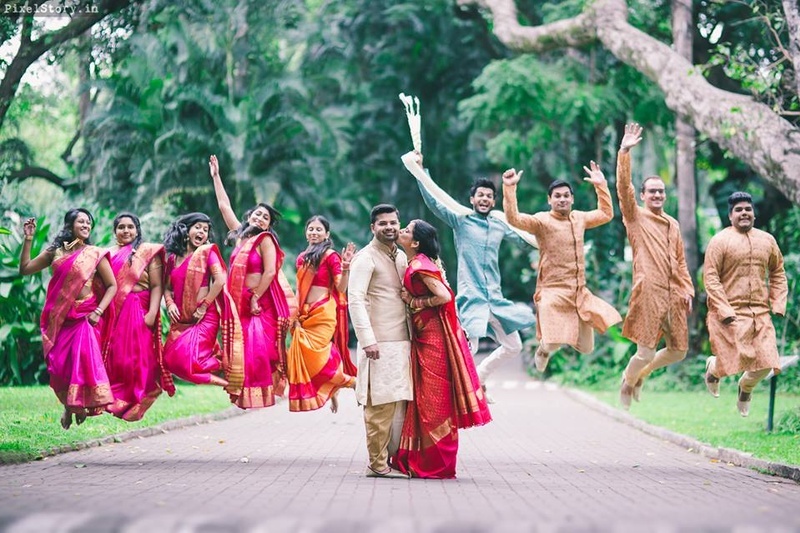 Quirky post wedding photoshoot ideas. 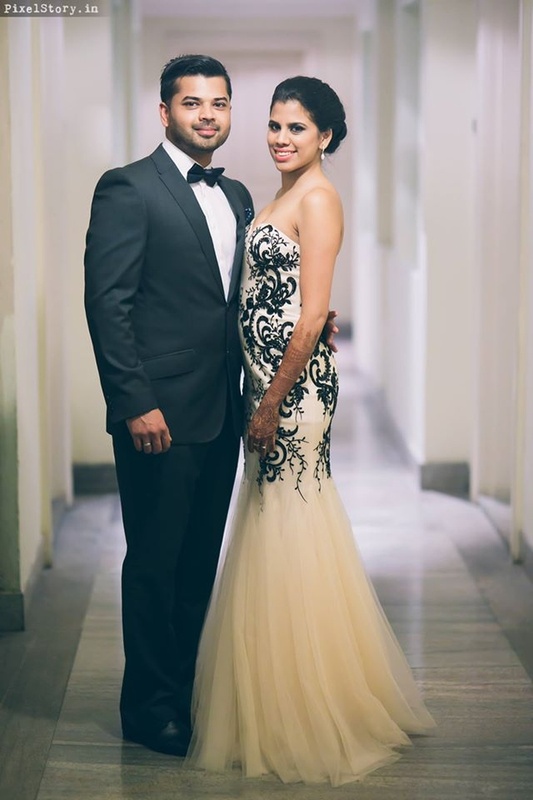 Beautiful white wedding gown by Duchess Boutique, Melbourne, for the after wedding party. 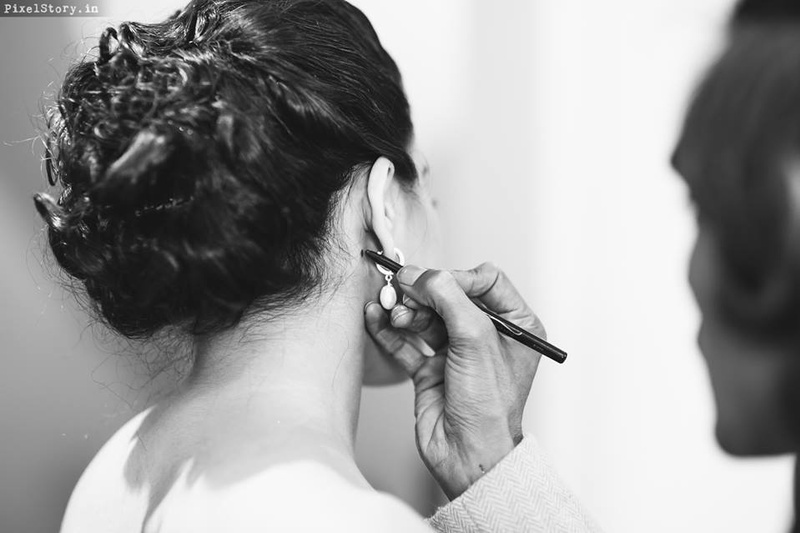 Getting ready for the after wedding party held at Taj west end, Bangalore. 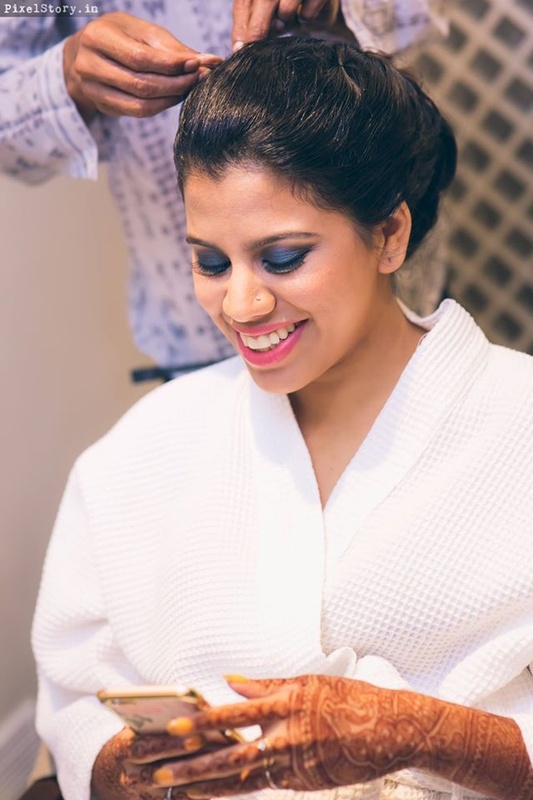 Complementing her bride in white color coordinated outfit for the after party. 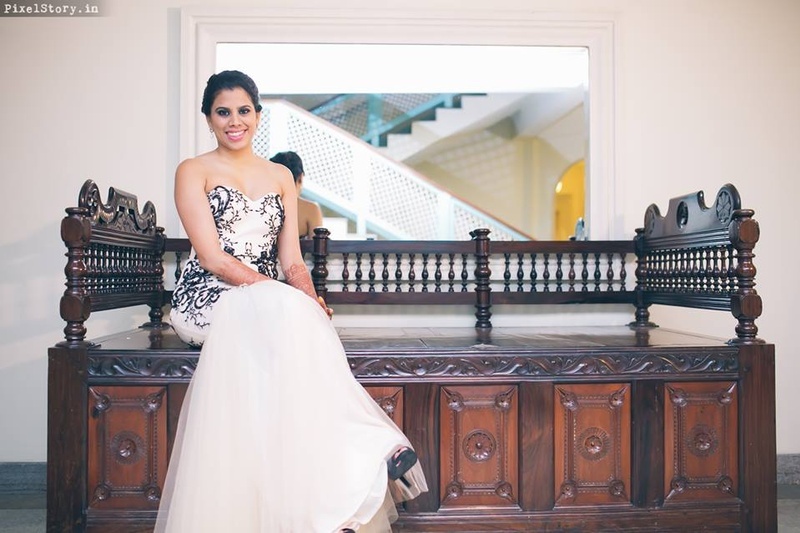 Wearing white gown with black embroidery work on it by Duchess Boutique, Melbourne. 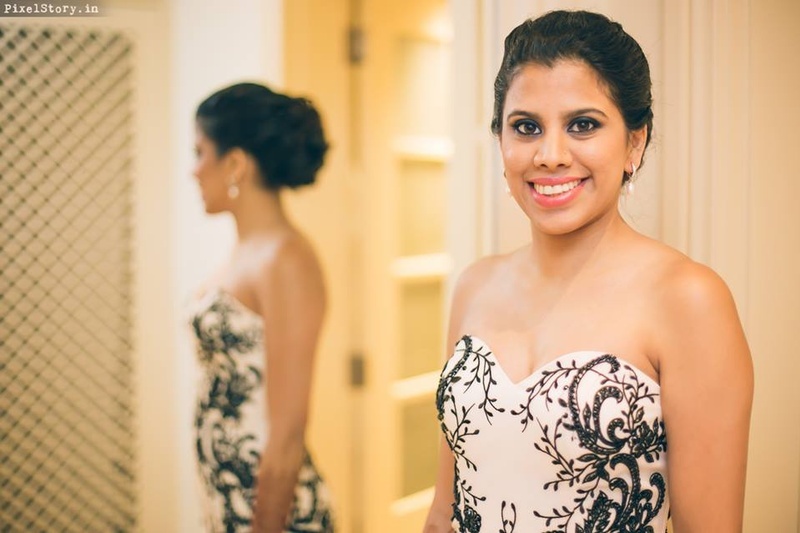 Wearing white gown for the after wedding party held at Taj West end, Bangalore. 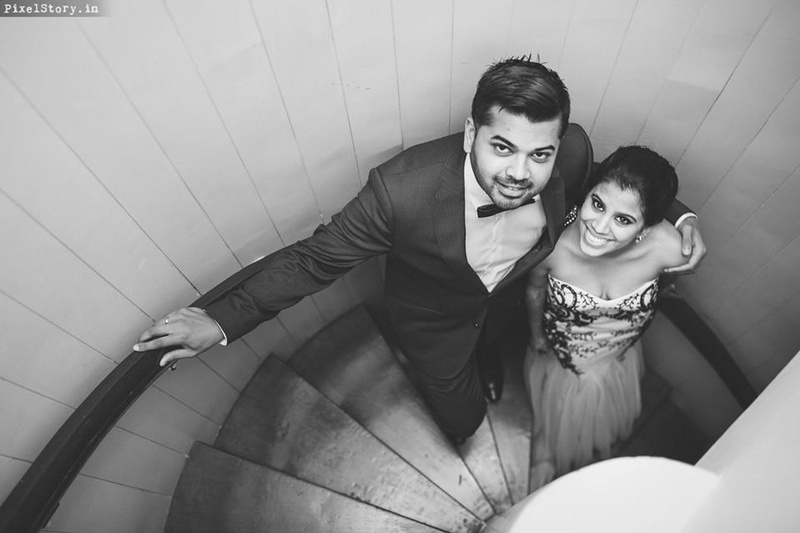 Entering their after wedding party venue. 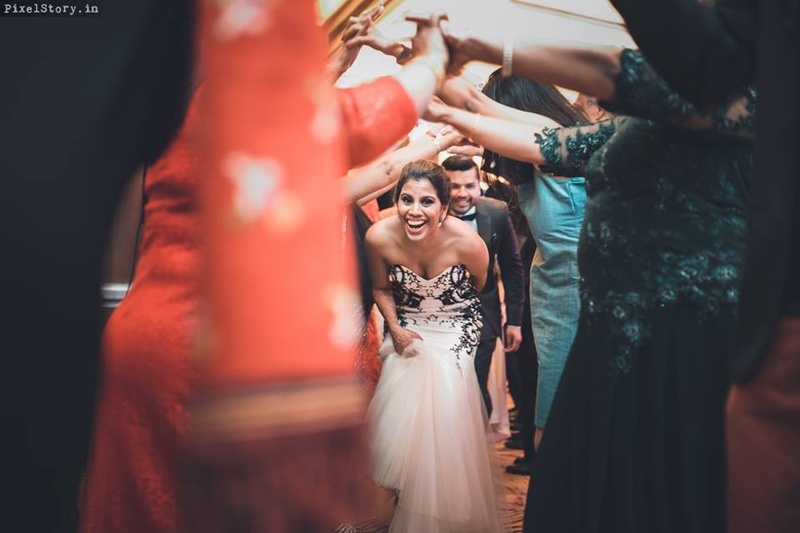 Some after wedding party fun. 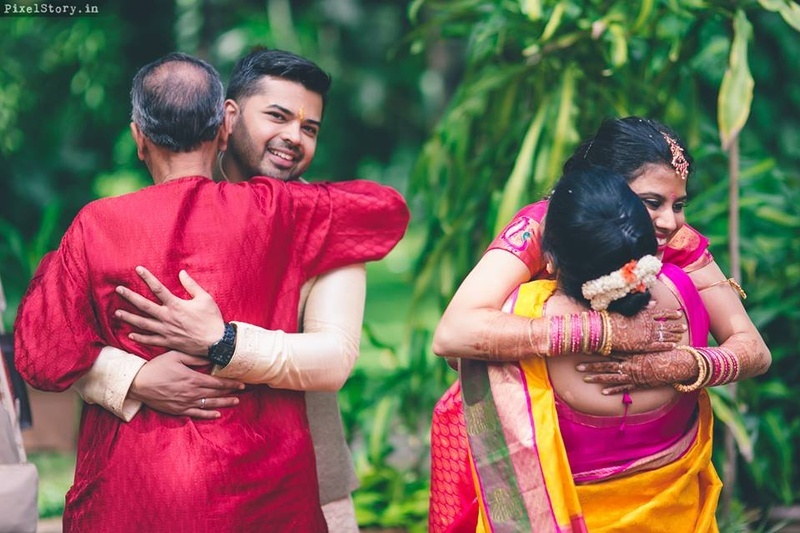 Bride and Groom looking at each other with love and happiness. 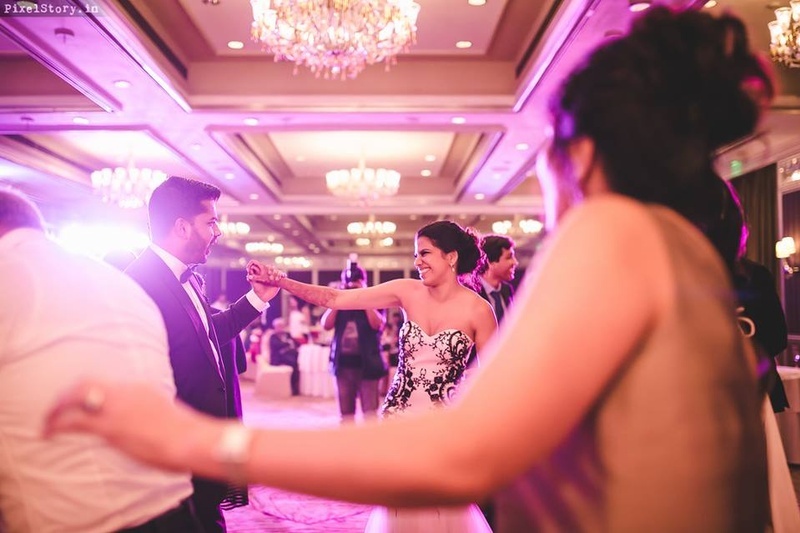 Ball room dance by the wedding couple. 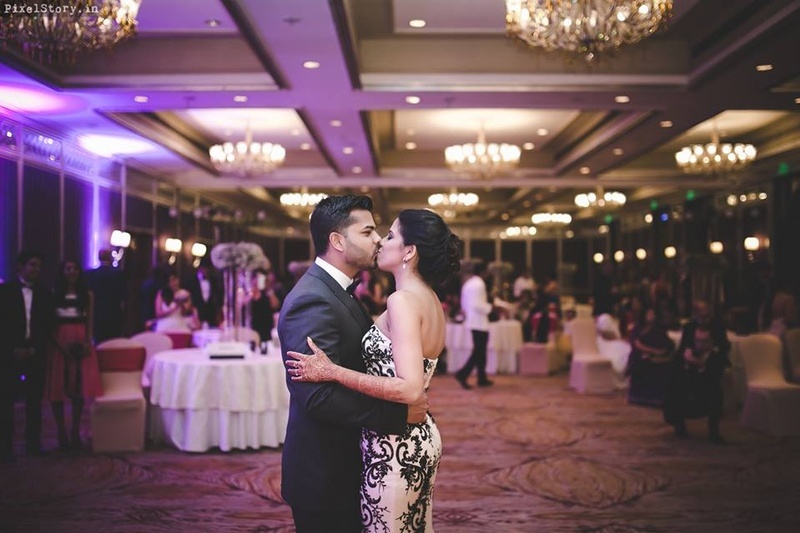 Dance performance by Bride and Groom. 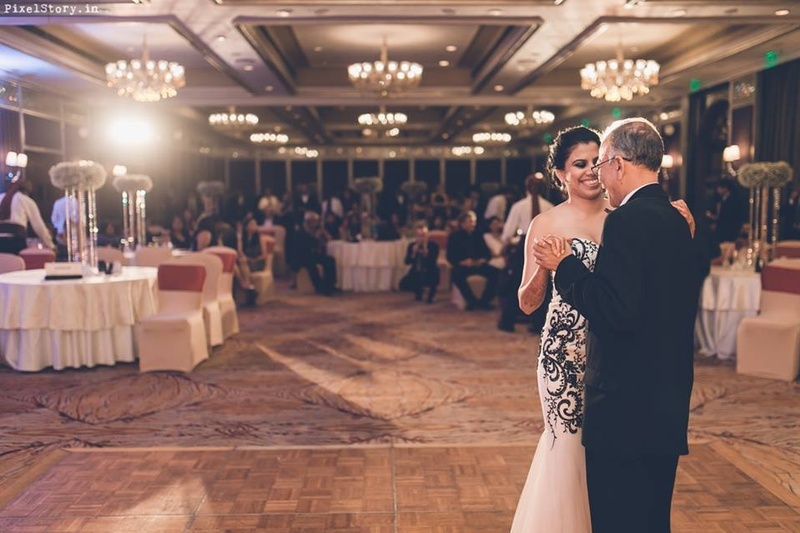 Pratibha dancing with her dad on her after wedding party. 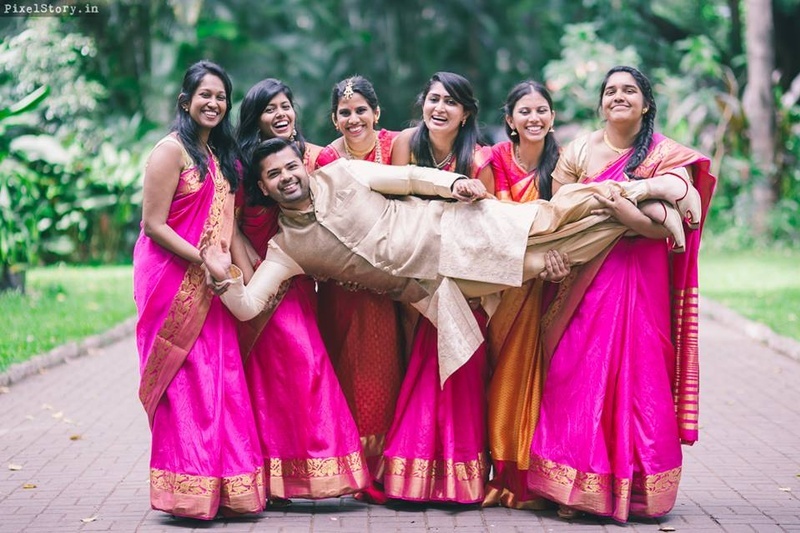 Color coordinated outfits look the best.